When I started researching my family tree in 1988, the hobby was quite solitary. 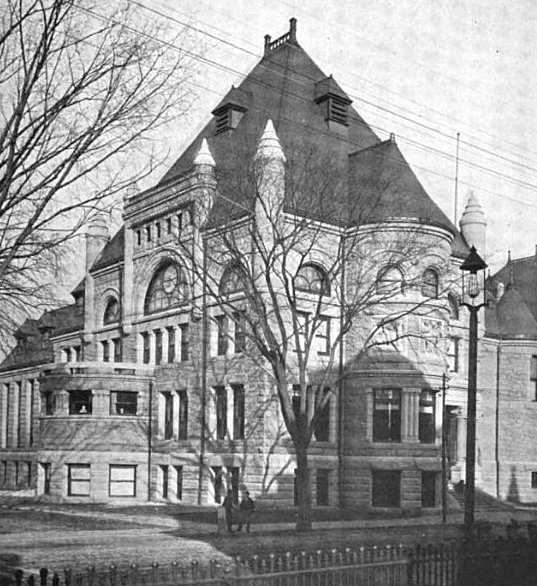 I spent hours in the local history room of the Pollard Memorial Library in Lowell, Massachusetts, threading microfilm reels of the local papers through the microfilm readers and leafing through dusty, yellowed City Directories. I remember the excitement of the first time I found my great-grandparents listed as young parents in the 1910 US Census, then the most recent census available, and constructing my first family tree from there. I traced them back through the earlier censuses and found their parents. I located birth, marriage, and death records; before long, I had traced almost all of my branches back to my gateway, or immigrant ancestors. You’ll notice that there is a lot of first-person narration here. In those days, genealogy was about as social as reading a book. At most, you might have found family members who shared various levels of interest in your discoveries. Or, you might have come across a distant relation willing to share information or your interest through snailmail correspondence. Six years ago, my wife and I, both avid readers of publications like Old House Journal and This Old House, bought a century-old home ‘for the charm’ and, at least in my case, to capture a piece of the past. We certainly accomplished this – and many fascinating, non-genealogy-related accounts narrating the joys and trials of owning older homes already abound in the blogosphere. One day, while trying to escape one of our old home tasks – it may have been repointing the fieldstone foundation or insulating the crawl space under our enclosed porch; the fond memory escapes me – I got the idea that I would research the house’s history. Within our closing documentation, I knew we had some death certificates of previous owners. And, more importantly, the deed of the previous owners referenced, within its last lines, the prior deed that had conveyed ownership of the home to them some thirty-five years before. Armed with these documents, I took a day off from work, and traveled down to the Registry of Deeds, and set to find the Book and Page referenced in the Deed. And I did, and within the last lines of that deed, I found the book and page number of an earlier deed. I spent a couple of hours, in the basement of the Courthouse, tracing one deed to the next, solitarily leafing through increasingly older deed books. As the dates on the deeds grew earlier, typed text gave way to the elaborate handwriting of an earlier time. And among the earlier owners of the house, I found a series of families who had lived in the house for a few years each. And then, I came across a woman, Grace Petrie, who owned the house for thirty years, preceded by her parents who had owned the house for the previous twenty. I diligently noted their names and the dates they lived in the house, and set to employ my genealogical sleuthing skills in combing through census records and newspaper archives. Luckily, by the time we had bought the house, these records were online and I quickly found obituaries and marriage notices and other interesting facts about the previous owners of the house. I learned that Grace had lost a twenty-five-year-old son, Chandler, in World War II when his plane crashed during a night combat training mission in Pueblo, Colorado. And, while digging near the flagpole in the yard, a few years later, I came across “CHAN” and “1944” etched into the concrete at its base. 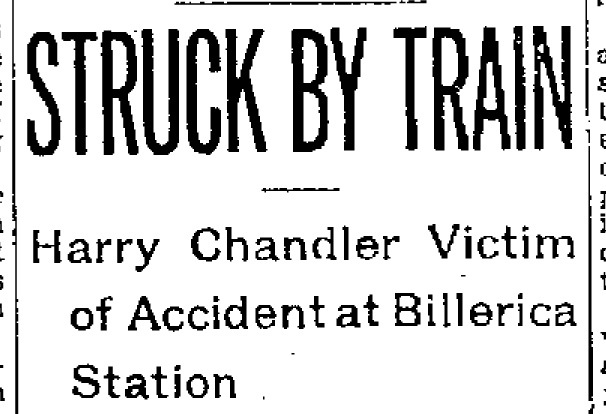 A search of earlier newspaper records revealed that Grace’s father, Harry Chandler, had been the station agent of the now-defunct South Lowell station. Being quite comfortable with trains, Harry had one day alighted from the train, before it had completely stopped, and was struck by another oncoming train. All of this happened in the woods, directly behind the house. While doing all of this research, I heavily relied on the newspaper records of newspaperarchive.com and on the census records and city directories scanned into the vast online resources of Ancestry.com. I also created an online family tree for Grace, in an effort to find surviving family members, who might have had old photographs of the house or property that could provide insight into how the property appeared in earlier decades (which is something us old home enthusiasts salivate about). 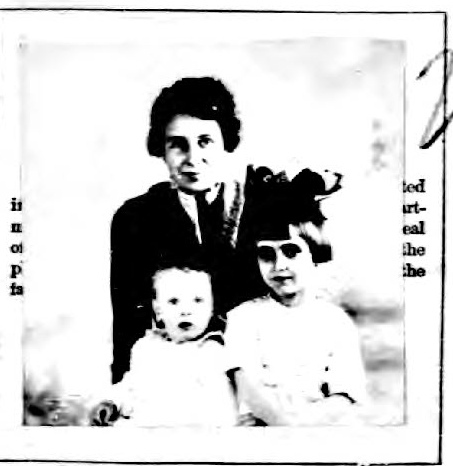 I found no living relatives (or old home photos), but Ancestry’s “shaking leaves” soon revealed Grace’s passport applications from the 1920’s. She had travelled annually to Cuba in the 1920’s to see her husband who had been working there as an expatriate accountant. And with those records were photographs of Grace, and her children. Up to now, however, all of this research was still quite solitary . . . and solitary it stayed. After all, while the art and science of genealogy and even house histories is frequently discussed – even quite animatedly – in groups, the fruits of those labors are often only interesting to those directly related or connected to the subjects. One day, however, several years later, I was contacted through Ancestry by one of Grace’s distant relatives, the grandnephew of her second husband, Earle Petrie, who had lived in the house, first as a boarder, and then as her husband until his death around 1950. Petrie’s grandnephew had found me through a “shaking leaf” in his tree. I shared with him what I had on Earle, who had left New Brunswick as a young man, settled in Massachusetts, and had lost contact with his Canadian family. On something of a lark, I searched old newspapers for further news of old Earle, who had worked as a car dealer in the area. I found a few advertisements for the car dealership where he worked, as well as an article of two that listed him as a salesman there. I forwarded these to his grandnephew, who was grateful to have them. And then, I found the real gem of the research – Earle’s Uncle David, who frequently visited the home. 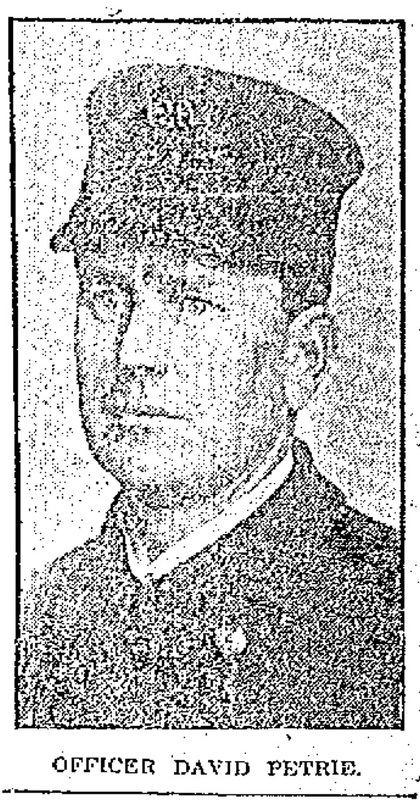 Uncle David, a police officer in nearby Lowell, Massachusetts, was something of a celebrity in the local papers, and this quickly came up when I ran his name through the search engines at newspaperarchive.com. In 1913, Officer Petrie had stopped a pair of wild horses charging through one of the Lowell’s busiest squares. Picture this: On a Wednesday afternoon in late January 1913, two runaway horses came charging onto Merrimack Street, the main thoroughfare of Lowell, Massachusetts, then a city of 110,000 people. The spooked horses pulled a heavy truck loaded with several tons of waste bales from the nearby Boott Mills. The driver of the truck, Francis Kennedy, had been thrown from the vehicle on one of its wild turns, but still held onto the reins, loudly warning pedestrians, motorists, and other cart riders of the runaway cart while he was being half-dragged across the uneven cobblestones of Merrimack Street. Officer Petrie turned at the commotion and took off on a run after the truck, while the horses plunged it and the flailing Mr. Kennedy toward a slower-moving electric car. With a failing grip on the reins, Kennedy managed to steer the truck past the electric car, but lost half of the heavy bales onto the road. Just beyond Merrimack’s intersection with Central Street, Officer Petrie waited and watched as the horses thundered closer, and into the path of Milo Hale, who sat in an automobile, unable to move from their path. Amidst the cautions shouted from the crowd of onlookers, Petrie waited for his moment, and as they crossed Central Street, he jumped at one of the horses’ heads, grabbing onto it, and, with Kennedy’s assistance, was able to sway the horses to the left, missing Hale’s car by inches. Kennedy and Petrie finally stopped the horses some 25 yards further down the road, avoiding any injury to pedestrians and other motorists and were considered to have saved many of them from certain tragedy. Soon after I found the article, I sent it to the great-grandnephew of Officer Petrie, in Montreal. He excitedly thanked me for my help with his family tree research and said he would share the story with his family. Although he had heard the stories of Uncle David, he and his family had not seen the newspaper articles from the Lowell Sun. And, although I had no real connection to David Petrie (other than the fact that I live in his nephew’s former home), I felt an interest in this man, who long ago saved lives, my own ancestors’ likely among them, on Merrimack Street in crowded Downtown Lowell. And, I realized that, with the advent of the internet and sites like ancestry.com, genealogy has expanded so far past those solitary days back in the 80’s when I strained my eyes under flickering fluorescent lights in the basement of the Pollard Memorial Library, on the same Merrimack Street where David Petrie performed his heroic act some 75 years earlier. Readers, do you have any research stories to share? Has your genealogy or house history research into the past made you any connections in the present (or resulted in any interesting tales)? Thanks for the tip, Diane. I just added an RSS feed. How fun! What an exciting tale. We had a person research his historical home in Kent UK then looked for descendants of the original owner. He found my tree on rootsweb worldconnect and made contact. I am forever grateful to him.